Dietitians in the US Armed Forces are working tirelessly to ensure the troops are well fed and well nourished. Obtaining and maintaining quality nutrition status is critical for the men and women serving in the US Armed Forces—whether they're risking their lives in combat or working hard behind the scenes. According to three active service members who are dietitians and bolstered by recent research, diet quality and evidence-based knowledge about nutrition in the military population has become increasingly important. Proper nourishment is a key factor in sustaining the optimal physical, mental, and emotional stamina needed to carry out demanding military roles. But much like those in the civilian world, military service members are deluged with unfounded nutrition information related to dietary supplements and fad diets, and are vulnerable to overweight and poor nutrition, disordered eating, and iron deficiency anemia. This affords an opportunity for military dietitians to provide them with accurate evidence-based nutrition information to help improve their health and quality of life. Read on to learn how military RDs are working hard to ensure the troops are well nourished and healthy to serve our country to the best of their abilities. Some of the immediate concerns in the military surrounding nutrition include the misuse of dietary supplements, fad dieting, overweight and poor nutrition, disordered eating, and iron deficiency anemia. Many military servicemen and women use supplements as a means to improve performance and overall health, maintain muscle mass, build stamina, and lose weight. But what many military service members don't realize is that supplements can pose various health risks if they're not taken in the correct manner. "Supplements are a big issue [because] a lot of airmen use dietary supplements," says Maj. Minette Herrick, USAF, BSC, MS, RD, IBCLC, chief of health promotion of the Air Force Medical Operations Agency. "[But] I think there's a lack of knowledge on the safety of supplements. People don't realize that they can be very harmful, and they're not regulated by the FDA. They tend to be what people think is a quick fix." Due to the lack of knowledge about supplement use, RDs lead evidence-based educational campaigns to boost awareness about their potential health risks and how to choose and take them safely. As part of the educational campaigns, service members learn how to get nutrition from food first with an emphasis on whole, plant-based, nutrient-dense foods with high bioavailability, and view supplements as secondary. For the most part, service members view supplements as performance enhancers and commonly use creatine, branched-chain amino acids, and various caffeine and weight loss supplements. In a 2016 cross-sectional study of nearly 1,700 Navy and Marine Corps personnel published in the Journal of the Academy of Nutrition and Dietetics, prevalence of supplement use in that population was significantly higher than in the general population. In the study, 73% of participants reported using supplements at least once per week, and 31% reported using five or more supplements at least once per week. To learn more, service members can visit the military website Operation Supplement Safety (www.OPSS.org/about-us). Similar to individuals in civilian life, military members are susceptible to the lure of fad diets to lose weight quickly, improve health, boost energy and performance, and eliminate toxins, despite the fact such diets are unscientific and unsustainable. Herrick says military RDs educate service members to debunk the common myths surrounding fad diets and help them understand why a balanced diet is the best choice and more sustainable long term. "We see a lot of people doing the ketogenic diet, Paleo, intermittent fasting, and a little bit of everything," she says. "There are a lot of cleanses and drinking instead of eating." Like dietitians in civilian life, RDs in the military must keep abreast of the latest fad diets and meet people where they are to establish and build trust. "We face patients who come in with every type of new diet, from cabbage soup to the 'nothing but Red Bull' diets," says Lt. Col. James Weinstein, USAF, BSC, PhD, RD, who serves as commander and senior biomedical science officer at Andersen Air Force Base, Guam. "And if we constantly come at folks with, 'You're doing it wrong. I'm the expert. This is the only way,' they shut us off and tune us out. We have positioned ourselves as the nutrition experts and pride ourselves on helping our patients make sound, science-based decisions on their health." Weinstein's pragmatic approach reinforces the importance of provider-client rapport as a true conduit for success. To effect behavior change, military RDs serve as consistent sources of accurate nutrition guidance so they can help service members set realistic goals to make lasting changes to their diets. Specifically, military dietitians educate service members on the consequences of following common yet extreme diet rules, such as significantly reducing or eliminating carbohydrates, which leads to fatigue and other negative side effects. They help ensure service members understand the connection between eating a balanced and varied diet and their personal health and professional success. Across military branches, overweight and poor nutrition are key concerns among service members. "I don't think it's any secret that the military struggles with weight management concerns and diet quality," says Stephanie Meyer, DrPH, MS, RD, LD, CHES, LTC, SP, a nutrition consultant to the Army Surgeon General and nutrition program director for the US Army Medical Command. "We recognize that this is a national challenge—one that affects readiness in the military," Weinstein says. "We're aggressively trying to combat [weight issues] from different angles, not just from an education standpoint, but also to affect the environment in a positive way by offering healthier food options on bases and in dining halls." Dietitians who manage military dining facilities run a stoplight system called Go for Green. The color green signals the most healthful options; yellow means caution is recommended; and red means to limit. The goal is to help increase intake of whole and nutrient-dense foods and decrease intake of nutrient-poor foods. "We really focus on high-octane foods that are good fuel and foods that really give you the best bang for your buck," says Herrick, adding that only about one-third of airmen eat enough fruits and vegetables. The military has a system called m-NEAT (Military Nutrition Environment Assessment Tool), which is designed to help RDs and other health care professionals evaluate nutrition policy and food quality in various food venues on bases. All military branches use the m-NEAT tool to help them determine how they're doing and what policies they may need to change. "RDs are focused on what the food environment looks like and how we can ensure more healthful options are available and easier to choose," Meyer says. In addition, Air Force RDs are working hard to offer nutrition education to service members beyond basic training by leading nutrition education and awareness initiatives and providing counseling throughout the troops' military careers, Herrick says. And dietitians are using telehealth to provide virtual nutrition counseling around the world for soldiers and their family members. "Nutrition plays a vital role in mission accomplishment," Herrick says. In addition to counseling military members about weight management and poor nutrition, Weinstein says dietitians educate the troops about disordered eating patterns, a trend that has been growing over the past decade. "It's definitely a concern and something that will be more important in the lives of military RDs as we go forward, as we counsel more and more people with symptoms and behaviors that are very challenging to combat," Weinstein says. Over the past decade, Weinstein's noticed more active duty members restricting food, binge eating, and exercising compulsively. "There's an additional level of stress [eg, physical fitness tests and traumatic stress] that's at least a contributing factor, for sure," he says. "This is definitely an area that's worthy of additional research and energy," Weinstein says. 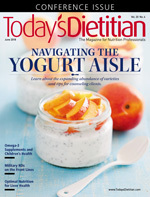 "Our dietitians are already putting their energy into it." Another nutrition concern among military RDs is iron deficiency anemia in young female recruits. "Our RDs are making efforts to combat [iron deficiency] in different ways," Weinstein says. "It is an area where RDs play an active role in identifying potential [dietary] gaps and shortfalls." To combat iron deficiency, dietitians are educating female service members on what iron deficiency anemia is, its consequences (eg, fatigue and dizziness), and the benefits of iron supplementation and increasing intake of iron-rich foods and vitamin C to enhance absorption. A study, published in the December 2016 issue of Sports Medicine — Open, of nearly 19,000 males and females who entered US Air Force basic military training found that 12.6% had iron-deficiency anemia. More than 25% of the 4,270 women and almost 9% of the 14,557 men had anemia. Men identified with anemia were treated with 325 mg tablets of ferrous sulfate (65 mg elemental iron) twice daily. Women were treated with 325 mg tablets of ferrous sulfate three times daily. All of the men and women received nutrition counseling by an RD. Because military service members play several different roles that require varying levels of physical and mental exertion, they will have a variety of nutrient and energy needs that require individualized dietary planning. Herrick says the Air Force employs RDs to address each airman's needs individually and develop a dietary plan based on that person's daily responsibilities. The airmen have diverse roles, and those participating in special operations or who are on the battlefield are considered elite athletes who engage in excessive physical exertion, Herrick says. Of course, the airmen who engage in the most physical exertion have the highest energy needs because they're burning considerable amounts of calories every day. "They're pushed to their limits both physically and mentally," Herrick says, and therefore they need extra calories from foods that are nutrient dense. And they need to eat snacks regularly during intervals to sustain them and make sure their hydration needs are met, she adds. With hydration often being a key issue among the most physically active airmen, RDs teach them how and when to hydrate as well as how and when to eat. "We want them to understand the correlation between how they fuel themselves and their ability to accomplish missions," Herrick says. RDs are now providing what's called "integrative operational support," which means they're working on providing their services and adapting to the specific nutrition needs of service members at each unit level. Because service members' roles, responsibilities, challenges, and environments are diverse, their nutrition needs mirror that diversity. For administrative military staff members who spend the majority of their day sitting at a desk in front of a computer, the focus is on maintaining physical fitness. "We try to make sure they have the right nutritional environment around them, and encourage them to get up and move throughout the day," Herrick says. "It's about making sure their nutritional intake is regular and steady and meets their needs." Service members who work with intelligence systems, otherwise known as "mental athletes," according to Herrick, have to be hyperaware and focused throughout the day, and therefore require strong mental agility. For these workers, RDs focus on helping them fuel up for 12- to 16-hour shifts. Dietitians teach them how to pack and include nutrient-dense, sustaining foods, which will help them focus, avoid energy highs and lows, and stay alert without consuming too much caffeine. "We ask a lot of our brothers and sisters, both mentally and physically," Meyer says. "Our expertise can help make sure soldiers have the gas they need to get the job done." Today's military dietitians have a long history that dates back to the early 1900s. In 1916, the military first recognized its need for dietitians, who worked as members of hospital units overseas during World War I. While many military RDs still are deployed, their roles have evolved significantly in that many have seemingly limitless job opportunities. "We all start out in very basic, usually clinical, foodservice types of roles, and the longer we stay in the military, the more leadership positions we'll have," Weinstein says. "There are opportunities to do nontraditional work (ie, working as executive officers to commanders and working in policy development) and traditional work in nontraditional environments, such as working on Navy ships or during deployment in Iraq and Afghanistan. Many of us have been deployed," says Weinstein, who currently lives in Guam. Weinstein spent time in Iraq and knows several dietitians who've worked in Afghanistan. Military RDs have to be creative and think critically when deployed, he says, because there are challenges they don't usually face in typical hospital settings, such as the extreme heat in Iraq, the large amount of sand and dust affecting electronic equipment, and the ongoing effort to keep foods at cool temperatures to prevent spoilage. However, "practicing dietetics in the deployed environment was the most rewarding time for me as a practicing dietitian," Weinstein says. "There were no distractions between me, the care team, and the patient. Everyone was working toward one goal: healing." "The role of RDs in the military has continued to evolve over time," Meyer says, "and that gives us additional opportunities to provide value to our soldiers." — Caroline Young, MS, RD, LD, RYT, is an Atlanta-based dietitian, freelance health journalist, and certified yoga instructor. She works on the marketing and communications team as a nutrition expert at the National Peanut Board and in nutrition counseling specializing in eating disorders at Alana Recovery Centers and in her own practice. She blogs at thewholeyogiRD.com. Opinions, conclusions, and recommendations expressed or implied within this article are those of the author and do not necessarily represent the United States Air Force or the Department of Defense. 1. Knapik JJ, Trone DW, Austin KG, Steelman RA, Farina EK, Lieberman HR. Prevalence, adverse events, and factors associated with dietary supplement and nutritional supplement use by US Navy and Marine Corps personnel. J Acad Nutr Diet. 2016;116(9):1423-1442. 2. Tilghman A. The U.S. military has a huge problem with obesity and it's only getting worse. Military Times. September 11, 2016. https://www.militarytimes.com/news/your-military/2016/09/11/the-u-s-military-has-a-huge-problem-with-obesity-and-it-s-only-getting-worse/. Accessed April 16, 2018. 3. Reinert B. Soliders use database to learn about MRE nutrition. The Fort Campbell Courier. July 16, 2015. http://fortcampbellcourier.com/news/article_885d755a-2be2-11e5-b446-bb8de7effdfe.html. Accessed April 16, 2018. 4. Bodell L, Forney KJ, Keel P, Gutierrez P, Joiner TE. Consequences of making weight: a review of eating disorder symptoms and diagnoses in the United States military. Clin Psychol (New York). 2014;21(4):398-409. 5. Myhre KE, Webber BJ, Cropper TL, et al. Prevalence and impact of anemia on basic trainees in the US Air Force. Sports Med Open. 2015;2:23. 6. Mathieu J. RDs in the military. J Am Diet Assoc. 2008;108(12):1984, 1986-1987.